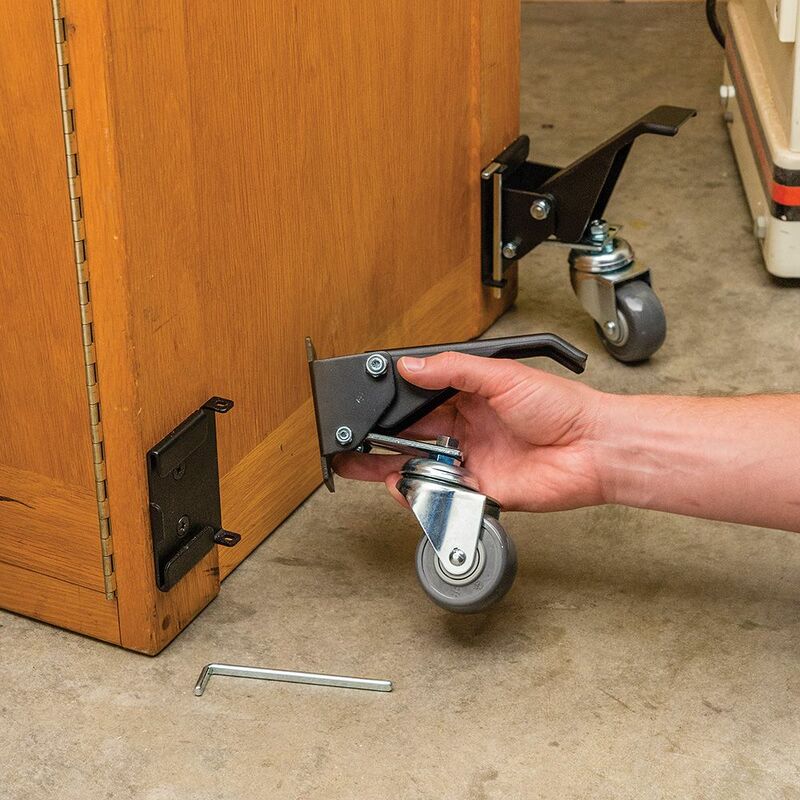 Allows you to quickly remove your Workbench Casters (#43501, sold separately) so you can access all sides of your workstation without obstructions. Our Quick-Release Workbench Caster Plates let you remove your Workbench Casters (#43501, sold separately) by simply removing the caster bracket pins. This means the caster levers won't protrude and interfere with your movement around the bench. 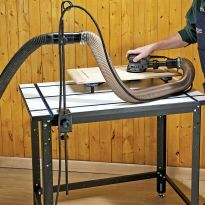 If your bench has an overhang, you can also store items such as a shop vacuum under the overhang without obstructions. 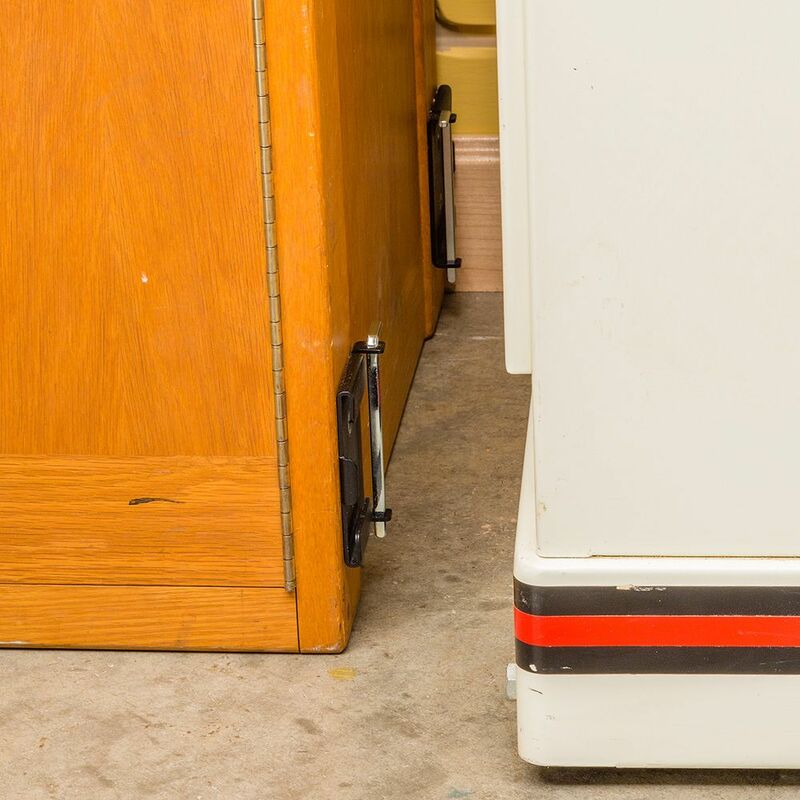 With your bench, table or power tool stand in the desired spot, just lower it with the foot levers, remove the pins, and the casters slide out laterally. Includes hardware for mounting to 3/4" panel. Powder-coated steel. Longer bolts may be required for thick workbench legs. Easy installation. Excellent economical way to move heavy machines around the shop using only one set of casters. because I was screwing these into 2x4s, I had to go get screws from the local hardware store. Other than than, easy to install. Plus, the casters go on very easily. Don't have to lift the table I installed them on. Consequently, I don't keep all four wheels on the table only two. If I have something on the table that is heavy, I add the 3rd and 4th wheels. But by keeping them off when not needed, they don't protrude into the work area for me to trip over. They're very convenient and are good when you don't have much shop space. Great for removing a tripping hazard around my workbench and works well with the designated casters. the quick release brackets are a great addition to the wheel kit. I have a work bench and a heavy wood lathe that I interchange them on. Saves me from buying more casters $$$$$ in my pocket. I alternate my caster set between my work bench & tablesaw with the addition the quick release caster plates. Works great & only takes a minute to to remove & alternate between equipment. I had two sets which I am using for a workbench and drawer unit. I got this set to use on a big chunk of Ash that I plan to use for my anvil stand. Work in progress no pictures. Now that I have tried the plates I'm going to purchase another set so I can transfer the wheels to other pieces of equipment. These plates are what makes the Workbench Casters so great. I will be ordering at least one more set the next time they come on sale. Very easy to install. BUT, the hardware package that comes with them should include 8- #14 x 1 3/4 inch screws as the bolts that are included won't work on anything thicker than 3/4inch material. Great addition to my shop. I can move the wheels to another machine and arrange my shop. They hold heavy loads as advertised. I use the casters to move a heavy router table/cabinet combination which has several drawers for storage of router bits and router accessories. The casters are easily engaged or disengaged. I installed a set of the Quick Release Caster Plates on the cabinet base to facilitate removal of the casters when they are not required, or when they are going to be required on another cabinet somewhere else (which I am building now). This gives me foot room around the cabinet. I don't have to worry about stubbing my toe when I am using the router table, or even getting by the router table.Write your review here. It must be at least 10 characters long. Consider whether you would recommend this product and what you like or dislike about it. I have used these adapter plates before. They allow me to use one set of casters on multiple tables which makes a lot of sense because rarely do I need to move either of my two tables. The kit comes with some small 1/4 inch bolts which are only long enough for a 3/4 inch thick mounting. I had to visit my local ACE Hardware and pick up some 4 inch bolts to mount the bracket to my table legs which consist of two 2X4s glued together. Choose carefully so you can still use the nuts and washers that come with the kit. The Rockler caster plates work great also. The perfect accessory for our casters. This was a game changer. As a prop designer and builder we struggled with casters all of the time. We tried to hide the in the prop or had to leave them exposed. These plates allow us to install the casters on the outside of the prop, roll the prop on to the stage and then quickly remove the casters for the dance. The girls won't trip in than and it looks more professional. I purchased these for my 400# workbench. It has 3-1/2" thick legs so I had to purchase flathead through bolts so as not to interfere with the casters and support the weight. Works good. Greatest thing since sliced bread! Simple to attach and use. No need to buy more casters just add plates to other tool and move the casters around. Save $$$! Well made. The hardest part of this install was taking off the casters on the stand they were on, so I could put on the quick release plates. Mounted the plates on two different stands. Easy to switch the casters back and forth. Had to buy lag screws because the bolts sent weren't long enough. Added these to my casters so I could remove them from a portable workbench I built- makes it easier to remove them so I don't trip over the casters in my small shop! If u have a workbench casters from rockler u must ha e these I use them for my router tables 3of them, my work bench, my outfeed table and my assembly/glue up table and I have 3 more sets extra. These were easy to install and use. I have them on all my major tool bases and workbench. They allow me to only have to have one set of castors. A real money saver! Excellent product , highly recommeded. Installed on two moderately heavy tools (band saw and drill press). It takes some foot power and hand pushing to get them raised but work fine. As other reviewer said use #14 screw and get them in straight. I use cheaper fixed wheels on the back and these in the front. Will buy more. Great money and ankle saver. Ingenious way to use the casters without dropping 70 bucks for every heavy machine. The caster set works well, but they are often in the way. Easy on and off, and secure, they really work well. I like these. I have a small shop so everything must roll, so I have attached 2 to my new router table, and will be adding 2 to my circular saw table. These allow me to attach the rollers when I need them and remove them when I need the space. Being able to move my entire table saw with a steel folding 5 foot roller extension table is now a dream. I haven't finished my workbench yet so I can't comment on how well they work (hence only 4 stars) but I can say they are very well made and heavy duty so I don't see any problems once they are installed. I definitely like the idea of using these quick release plates on a few of my cabinet type bases that I don't move often such as my table saw out feed table/workbench, my shop made wooden lathe base and my shop made wooden router table. Since I don't move these often I plan to install these caster plates on all my mobile bases and only purchase 1 set of casters that can be used on each base as needed. Saves me money! They did exactly what they said they would do. However after receiving them I saw that they had only two mounting holes. The wheels that are used with thses brackets have 4 mounting holes to help support the weight. I think the brackets should have had 4 or 6 mounting holes. The mounting screws and nuts that come with these brackets are for metal or material less than 3/4" thick. I am mounting the brackets into my wood bench legs so I had to go and buy #14 wood screws to mount the brackets. I really like the idea of how these worked. I mad a template out of wood to mount these onto a metal work bench.I prepared 4 blocks of wood by cutting a piece of cabinet grade ply wood to 3 inches longer then the bracket and 1 inch wider. I the set up a jig on my drill press to drill 2 holes into each of the 4 blocks producing 4 identical blocks. I then used my blocks as guides to drill mounting holes into the side of my metal workbench. I attached the plates in sandwich form: Caster plates, workbench side, wood blocks on the inside with fender washers to form a tight sandwich giving support to the metal sides of the workbench. Works flawlessly. Mounting to 4x4 legs. 1+" #14 wood screws would have been a nice (expected) add. They are little hard to install for an old man but after I bought some 1/4x 2" Phillips head screws to replace the short bolts with the kit, they mounted fairly well. I have a roubo style bench and that supplied 1 1/4 bolt just won't cut it. My only complaint would be is that the bolts are to short. You need much longer bolts or some long wood screws. Other than that I think they are a great idea. I put on a planer bench and it was good. The wheels came off a starage cabinet and to drill holes for the bracket is in line with the bottom shelf which is going to be difficult to get correct. They would be even better if the casters were a little larger and the included bolts longer. sawing long bolts to length is easier than stretching short ones. Without the caster plates, the workbench casters were a trip hazard. The plates allow for quick removal of the casters from the workbench and should have been a part of the caster package. I would have rated them higher, except the plates came with short screws made for 3/4" thick legs. My bench stands on 4X4" legs. It was impossible to find flathead lag screws, so I used #14 flathead wood screws to mount the plates. I also found mounting the plates higher on the leg to allow only 1/2" lift on the casters makes for much easier operation when it becomes necessary to move the bench. My workbench is too heavy to slide, so the casters became a necessity. I use the underside of my bench for scrap setup pieces and decided to place the castors on the inside of the legs vs out....this limited my storage but improved "toe safety". With the castor plates they can now be stored between moves and opens up my storage completely. Be sure and get proper sized flathead screws for installing on solid legs as the hardware set does not include these...had to do some creative adaptation to make it work, but does work flawlessly! 4 stars due to lack of hardware only. Works like a charm. It will save you money. Like like this product, allows my workbench to be moved & casters removed for easy access. I added these plates so I could drill through my bench 4X4 legs and bolt them with a nut and washer. My bench is heavy and I hope to avoid the screws pulling out of the leg. Great item. I have multiple items to move so I am putting plates on each one with one set of casters in each location - home, shop and work. Ease of maneuvering work bench in small shop. so that one set of casters can be utilized on multiple pieces of shop equipment. I have the casters on my bench (love that my bench is now portable) now i'll be able to remove the casters so I don't trip over them. To attach to and move heavy, stackable weightlifting boxes so I can easily remove them while lifting. For my new bench table. Was youtubing and came across Wilkerdos work bench build and I liked these casters, as I am planing to build a mobile/stationary workbench, and like how these operate! 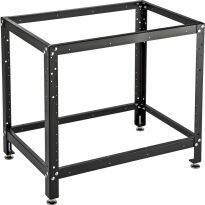 I have a work bench I move, I am buying the Workbench casters, these will allow me to remove the wheels so they are not in the way once the bench is positioned. Need to place them on a mobile tool stand that has two wheels in the back and two legs in front good grief huh? I wanted the ability to remove the casters when not needed. I have 2 sets already and they work great! I only need 1 set of caster wheels with these. Certainly be a help in my small shop. Move things around in garage. My large power tools are all on casters but I have two large heavy workbenches that are not currently mobile. With a couple of sets of these quick-release plates and one caster kit I can move as needed and remove the casters once done. I often walk around my workbench and would rather not trip on casters. For my router table and a workbench. I can use one set of casters. I picked these plates because I am constantly tripping over the castors at the end of my bench and legs of my machinery. It will be a relief to remove the castors and still be able to reposition them for moving heavy equipment around my shop. As advertised; you can leave them in place after moving the structure/cabinet. This will work with the Workbench Caster Kit 4 Pack. 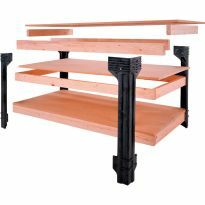 You can then remove the Casters and store them away or use them on a different cabinet if that is set up the same way. Previously ordered the casters. These will allow me to remove the casters to keep the floor area clear. Great addition to a work bench! I saw it on April Wilkerson's youtube video and liked it. I am building a new work bench and want to be able to move it around! This is a great way to get the most out of my castors. Saves money putting wheels on multiple stands. Also gets wheels out of the way when working. Using these plates the casters can easily be removed to eliminate any interface walking around the cabinet . Also with additional plates the casters can be used on another piece of equipment? Need this item for a drill press stand I'm making. Like the idea that it will allow caster wheels to be removed. I already have the casters on one bench and would like to expand their use to other items. And they were on sale. In order to change casters from table saw and workbench. To go with casters previously purchased for a mobile workbench. looks like what I need for my workbench. Allows me to remove and store casters when not needed. Need way to move machines around in shop. My bench is easily 350lb plus. Just guessing never weighed but I'm sure. Rolls just fine. I need 6 caster / mounting plate combinations. Do I have to buy 8 sets? BEST ANSWER: There are 4 in a set, so 2 sets would give you 8 casters and/or mounting plates. The casters and mounting plates come packaged four to a carton. If you need six sets then you would need to buy 8 sets. These have proven to be very strong I wonder why you think you need six rather than four sets? I am very pleased with these units. For me it was very cost saving since I only had to buy a set of four castors and three sets for mounting plates (workbench, drill press and bench sander. Saved a lot of money. I would be interested in finding out how you make out. i am using Husky 6 ft. Solid Wood Top Workbench Model legs. can i use longer screws and how low or high should i put the bracket? Have you tried this lifts on a Delta Table saw mobile base? BEST ANSWER: No,I am using then on my cut off table for my Sears table saw. they work great. No, I purchased mine for a workbench I built. They are very substantial when used with the Rockler casters. They do mount higher than the casters so you want to make sure the hole pattern would fit on your base. No I haven't had a chance to install them yet . My shop is too cold to work in right not.I plan on install them on a jointer table this spring. No, I have them on a bench I built. I work in a two car garage and need my tools to be mobile. No But I have used them on my Solberg bench and they work very well . 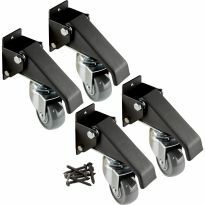 Has anyone tried mounting larger casters to this set? I have to mount it higher than the 2" that these specify. My requirement is that the first screw must be at least 2 5/8" off the floor. I'm thinking of putting a 3" caster on the mounts to raise the lower bolt for the quick release plate to 3 1/8". Any thoughts? BEST ANSWER: I had a similar problem and just mounted the caster set a little higher. It works good but just leaves your stand or whatever a little closer to the floor. Measure your clearance and just allow for that to allow space to move. 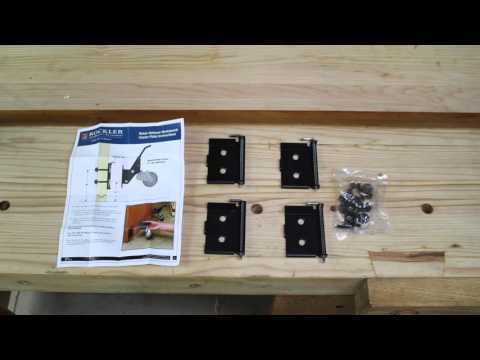 Will the Rockler plates work with the WoodRiver work bench caster set? BEST ANSWER: Yes they will. I think they are the same manufacturer, just different box/brand. It worked for me. They look very similar, but I am not sure of the mounting plate dimensions. The Rockler plates work perfectly with the Rockler wheels, though. They make it easy to use one set of wheels with multiple tables. Sorry, I am not familiar with the WoodRiver product. I works well with the Rockler casters. Is it possible to use screws, instead of the "bolts," to mount the caster plates? BEST ANSWER: For those interested I found that flat head #14 screws of your desired length fit the best and don't interfere with sliding the casters into the plate. I forgot to add, get a #3 driver bit (impact) if you don't have one. The screw heads are large. It worked for me. Used the screws that came with the casters to mount the plates to the legs of my large and heavy workbench. Don't move the bench often but everything works well when I do need to move it. I bought your caster set 3 or 4 years ago for a bench I was building but ended up not building it. I would like to use them now and wonder if they will work with the plates? BEST ANSWER: I would think they should, but it does depend on which casters you purchased. Rockler has a return process if they don't work. Yes they will. I have 1 set of casters and three sets of plates on two work cabinets and a workbench. 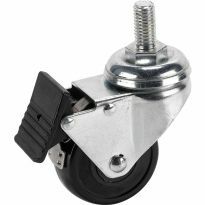 Does using the quick-release caster plates lower the load rating of the casters? BEST ANSWER: I did not read that in the literature and I would guess the answer is no, the quick release brackets are the same material as the casters so I would guess there would be no reduction. I can't really say! but I don't see why it should the way they are built strong and the way they attach, they should carry the same weight, mine are working fine on my bench. For Item #: 53004 does it come with caster wheels or i have to buy the wheels separately ?? BEST ANSWER: No, the Workbench Caster Plates do not come with caster wheels, they come separately. 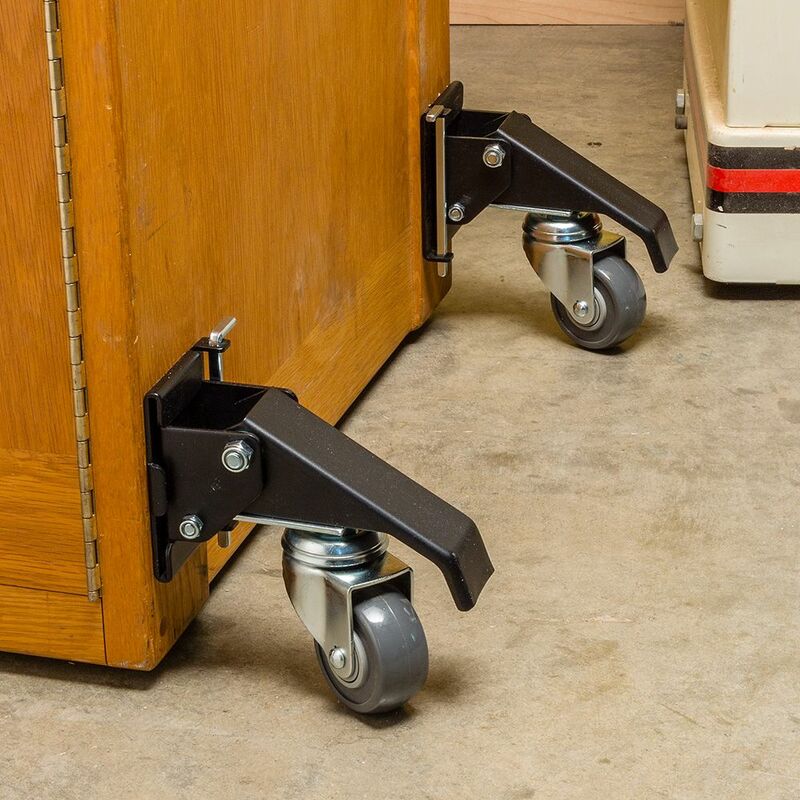 However, you can buy multiple sets of the Caster Plates and only one or two sets of the caster wheels and save yourself some money, that is if you don't mind swapping the caster wheel sets from unit to unit. 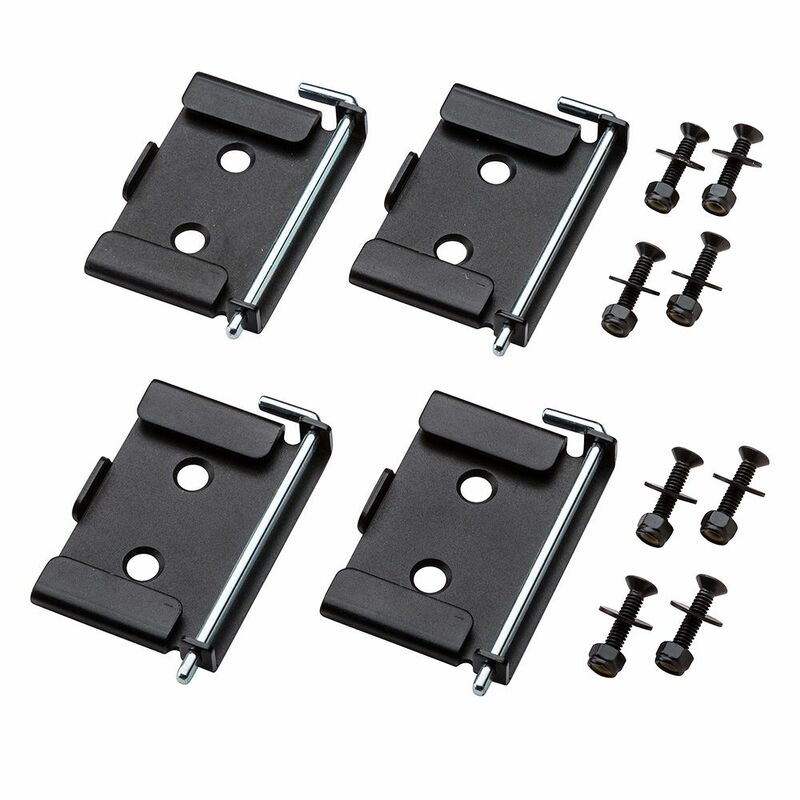 I already have the Powertec 17000 version of workbench casters installed on a bench and wondering if these Rockler Quick-Release Plates would be compatible. Has anyone tried matching these on an install? I would like to maybe use it as method to go from the kitchen island to a regular dining table. Will it for work for this? Can the structure be in stable position even when on casters? How many inches will it go down when the casters are put to the side? Thanks! BEST ANSWER: When you put the castes down it will raise the table approximately 1/2". I have installed these on 3 different tables in my shop. I generally leave the casters down so I can easily roll the tables around. The casters are very stable in the down position. Thank you so much. Not enough of inches to go down to normal height dining table but maybe I can use some larger casters? Food for thought ;-) Thanks again. Can these be mounted to angled steel legs? I want to use them on my Performax 22-44 sander and Belsaw planer, both of which have steel bases with angled legs. BEST ANSWER: I don't know what is angle on the legs of your base, but you can to read instructions and see how they mount (distance between holes), The plate of caster must to be mounted vertically. Can I put it on a square aluminium tube of 30mm? How wide is it? BEST ANSWER: The backing plate is 7cm wide and 9.5cm tall. 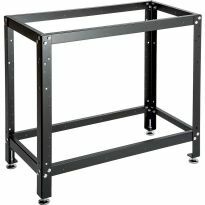 When the casters are in the deployed position how high is the table elevated off the ground based upon the measurements found here on the Rockler site for mounting the hardware?